I’m assuming because you’re reading this you have survived Christmas. You weren’t trampled to death at Walmart at 10pm on the 24th attempting to snag the last bag of Ghirardelli peppermint bark or suffocated under a mountain of discarded wrapping paper. Whew. Glad to hear it; I was worried about you. I also have survived. My big success is that I didn’t have a brain aneurysm while frantically brainstorming last minute Christmas gifts for impossible to buy for family members. My mother is a compulsive shopper with really good taste. So when she sees something she wants, she researches how to buy it for 10% less than anyone else has before and obtains it. My poor, shopping disabled father has been trying to years to find things she hasn’t already bought for herself that she will like (let’s not speak of ‘the briefcase incident of 1989’, it will only cast a cloud of darkness over the holiday season). 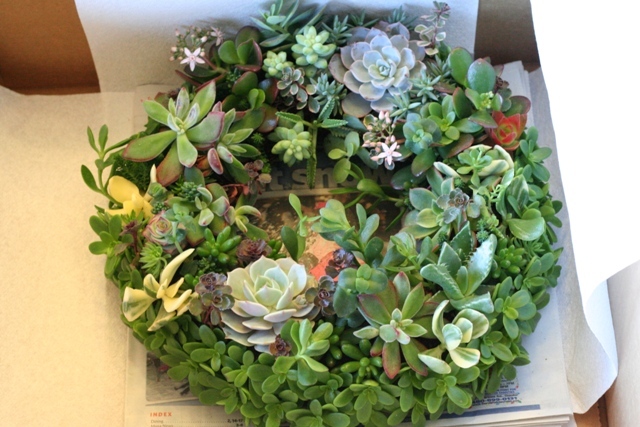 Like anything else I ever do, the steps I took to get from, ‘I think my mom would love a living succulent wreath’ to ‘Here is your living succulent wreath, Mom!’ didn’t exactly proceed in a logical straight line. Step 1: Determine I’m going to create wreath myself. Step 2: Find a video online explaining the process of creating wreath. Step 3: Get Jason to watch the video with me so we can figure out how to make the wreath. Step 4: Have Jason look at me like I’m a lunatic and threaten to commit me if I even attempt to add this herculean task to my already undoable to-do list. Step 5: Decide I’ll just wait until December 23rd and buy one somewhere (logic being: we live in Arizona where there are lots of succulents, it’s Christmas time and people make wreaths around Christmas, a living succulent wreath is a really awesome thing, they probably sell them in every nursery, right?). Step 7: Rush home and Google ‘living succulent wreath, Phoenix’ (no, Google, not ‘living successfully with screwed up people,’ we’ll discuss that tomorrow) and find this article. Step 8: Make poor Patti Smith really sorry she gave Phoenix Magazine a phone number for contact by leaving her an 8 minute voicemail begging her to make me a wreath and let me come over on Christmas Eve to buy it from her. Step 9: Get insanely lucky that Patti Smith doesn’t think I’m a deranged lunatic and change her phone number and instead calls me back to tell me she’ll make me a wreath and I can bring cash and pick it up (she did, however, call me a ‘crazy lady’ on the phone). Step 10: Drive out to Apache Junction and pick up the stunning wreath from the super nice and clearly compulsively creative wreath artist. As much as I curse the universe for regularly raining chaos down upon my life, it does occasionally reward my total procrastination and incompetence with insanely undeserved success. So I guess we’re even for now, Universe. My other gift-giving success this year was a cookbook I made online and had printed out for my family. This year we did a bunch of food competitions and group dinners that were really fun, so I compiled some of my favorites of the recipes and added pictures and color commentary. It’s filled with family jokes, but here’s a link to check it out if you want to see it. My favorite recipe is Todd, John and JT’s Smoked Meat (and Marinated Livers) on page 13. I think I might make this book a yearly tradition. What were the favorite gifts you gave and received? I am unsure of which is funnier, this line: “Naw, I don’t have any of those. I don’t know who would. Maybe try Cactus and More down the road two miles. They have weird stuff there,” or the fact you were called “crazy lady” by a wreath maker in Apache Junction. Either way — this post made me cry, I was laughing so hard. Also, I want a wreath. It’s pretty!